Ajax recently introduced a new range of IBCs based on the latest hopper design technology that have greatly improved flow prospects over conventional bins. In most cases these allow difficult flow materials to be reliably discharged without the use of dedicated discharge stations or specially designed fittings on each bin. Not only does this offer a significant saving in cost and operational flexibility, but freedom from fixed discharge stations result in cleaner site arrangements. These Bins are designed to secure an optimised balance between enhancing the flow characteristics for reliable discharge of difficult flow materials, whilst securing the maximum storage capacity within limited headroom. They exploit fundamental features of the latest bin design technology to overcome arching, ratholing and feeding problems with products that have difficult flow characteristics. Contrary to many static storage hopper duties, IBCs are normally completely emptied before refill. Uneven residence time therefore is not significant so the benefits of mass flow only need to apply to the outlet region of the bin. 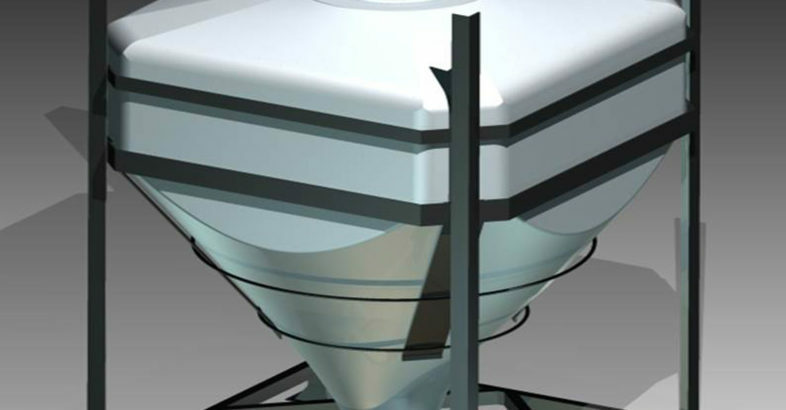 This allows the bulk holding capacity of the bins to be maximised by employing a square body section with radius corners to offer good release properties. The key region for reliable flow from the bin is the region immediately prior to the bin outlet and it is here the design exploits the combined advantages of mass and plane flow geometry to secure the outstanding flow benefit of achieving the discharge reliability of an outlet that is superior to one twice its diameter fit on a conventional conical bin. The intermediate section converges, via a transformation shape, to a special, plane-flow shaped discharge section that optimises the balance between excellent flow characteristics, total self-clearing and maximum holding capacity. 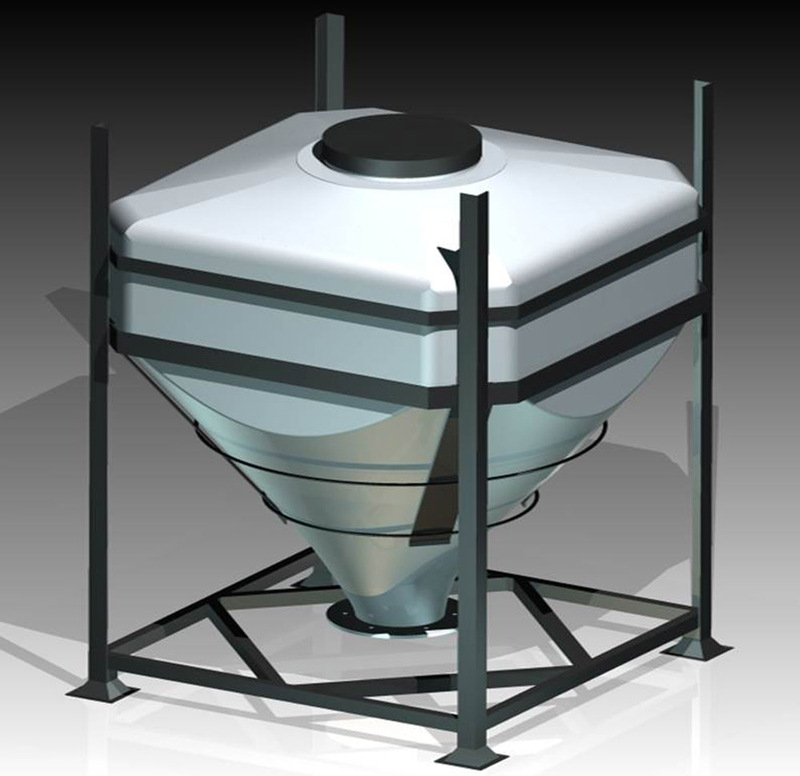 The seamless body is formed by blow moulded in MDPE – polyethylene, a tough, medium density thermoplastic with good impact strength and recovery from distortion, the result is an economical, gravity flow bin of hygienic construction that will handle many difficult flow products without the need for dedicated, vibrating discharge stations or complicated discharge mechanisms on each bin. This results in unrestricted operational flexibility, excellent hygiene and low system cost. Holding capacities range from half to two cubic Metres. The bins have a mild steel frame that can be stacked. Performance of the bin can be verified by Ajax powder tests on a sample of the bulk material to be stored. Alternatively, bins are available for site trials and, being interchangeable with conventional bins, offer an opportunity to prove their performance with minimum inconvenience and cost. Reliable gravity flow without the need for vibrating platforms or special discharge fittings. Clean, hygienic internal surface. Full FDA accreditation. The economy and flexibility of requiring no fixed discharge station. No spares, power or maintenance requirement. Gravity is free and reliable. Wide range of standard accessories. Fully interchangeable with conventional bins. Loan bins available for site trials. Performance can alternately be verified by powder testing. Half to two cubic metres holding capacity. AJAX have been manufacturing a variety of solids handling equipment for over 45 years, our product range includes screw conveyors, screw feeders, continuous mixers, lump breakers, heat exchangers, drum emptying systems, cryogenic coolers and gravity flow hoppers. Our equipment is suitable for handling and processing a vast range of materials for every industry incorporating a wide range of powder handling and processing applications.